The World Cup beginning in South Africa this week is the icing on the cake of African football’s contribution to the global game. It is a contribution that was heralded so memorably by Roger Milla’s World Cup goal celebration “wiggle” in 1990, after he scored for Cameroon against Romania, and has since been cemented by the ubiquity of African players at top-flight European clubs. In Africa United, the former Independent on Sunday Africa correspondent Steve Bloomfield sets about an audit of some of the more troubled African countries, to show how they have managed to field teams despite all manner of strife, from corruption to genocide. Providing an overview of each country’s woes on and off the field, the book begs the question, by accident rather than by design: how important is sport and how important should it be? Is it right that the Congolese government spends £3.5m on the sports ministry and half that on its justice ministry? Does remarking of Zimbabwe that “during the worst years of Mugabe’s rule, at a time when every other part of Zimbabwean life was falling apart, the country’s footballers had managed to compete with Africa’s finest” open the way for a suggestion that football is, at worst, an opiate of the people? Bloomfield’s implicit point is that football gives hope where there once was none. Some African national teams have been built with players who were once at odds with each other, either because of the colour of their skin, as in South Africa, or in actual conflict, as with the Ivory Coast team made up of players representing two sides of a civil war. Meanwhile, the feelings of hope and aspiration that football engenders in the young African population means that a shred of comfort can be held on to in lives that are often otherwise difficult. In between his assessment of the footballing pedigree of countries such as Somalia, Kenya and Rwanda, Bloomfield shoves in a lot of political background, rather like the way Ben Elton used to joke that he was shoving “a little bit of politics” into his comedy routines. Both writers share a rather jumpy yet urgent rhythm. Bloomfield could benefit, however, from a little more passion in his reportage. Some would applaud him for his steady tone, but there is freedom in a collection such as this to go beyond implication. 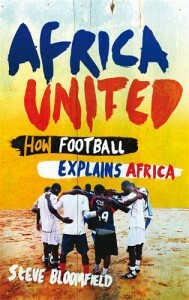 Where possible, in his dealings with the African footballing community and encounters with politicians and the military, Bloomfield lets inherent ironies and wry moments speak for themselves, and there are some striking observations on, for example, the influence of European club football. Its influence means that people are more interested in Manchester United’s fortunes than their own local team’s; that Thierry Henry shirts are worn in the most inaccessible parts of the Congo; and that a league team in Zimbabwe is called Gunners in homage to Arsenal. Unlike most books on offer to mark the World Cup, Bloomfield’s work will endure beyond next month’s final. His work is a welcome by-product of the focus on foreign players in English leagues, and encourages a world view that goes from Stamford Bridge to Sierra Leone – a must for football fans with more than just a cultured left foot.